A: Hawa Mahal was built in 1799 A.D by Maharaja Sawai Pratap Singh. A: The entrance is through the City Palace where doors open into a open spacious courtyard with two-storeyed buildings on three sides. Q: How many windows are there in Hawa Mahal? A: There are 953 windows. Q: Do you know that Hawa Mahal has no foundation? A: That’s correct. Hawa Mahal was built without foundation. In fact, it is the tallest building in the world without a foundation. The five-storey building managed to maintain upright because of it is curved shaped. Just another masterpiece of Rajput and Mughal architecture. Q: What is the meaning of Hawa Mahal? A: The word “Hawa” means wind or breeze and “Mahal” is palace. So Hawa Mahal is the palace of breeze. Q: Who designed the mahal? A: It was designed by Lal Chand Usta in 1799 by the order of Maharaja Sawai Pratap Singh. Q: What is the purpose of building Hawa Mahal? A: Royal ladies were not to be seen by public. The palace was built such that the ladies can watch festival celebrations and all other activities on the street without being seen. Q: Why are there so many windows? A: There are two purposes for the seemingly excessive number of windows. First, when there are windows everywhere, the royal ladies can look out to the street anywhere they want. Secondly, the windows allow breeze to flow through and help to keep the palace cool. It thus makes it an ideal summer palace. Q: What style of architecture is it? A: Hawa Mahal exhibits a unique combination of Mughal and Rajput architectural styles. 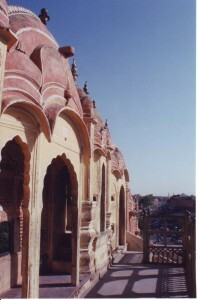 A: Hawa Mahal is carved out of red and pink sandstone. Q: Does it relate to any god? A: The palace is devoted for Krishna and thus in the shape of Lord Krishna’s crown.